Monday November 19, 2018: Ava puts her plan into motion, Drew disagrees with Kim's latest idea, and Stella runs into a face from the past. At the Metro Court, Ava breaks into Sasha’s room after drugging the soup she ordered from room service. She finds Sasha passed out on the bed and uses her phone to text Griffin and suggests a meeting to talk with Kiki about the misunderstanding. Ava then stages the scene to look like a seduction. Back in the restaurant, Jordan and Curtis discuss their wedding tomorrow. Curtis still hasn’t heard from Stella. At Kelly’s, Griffin speaks with Michael about the meeting with the board to return to work. Mike and Stella arrive for lunch and run into Michael and Griffin. Griffin gets the text Ava sent and has to leave, and Michael heads to work. Stella and Mike grab a table, and Mike tells her about the new woman at the center he is having fun with. A man notices Stella, and she’s shocked to see it’s her long-lost love Marcus, (played by Nigel Gibbs). They hug, and Mike invites Nigel to join them. 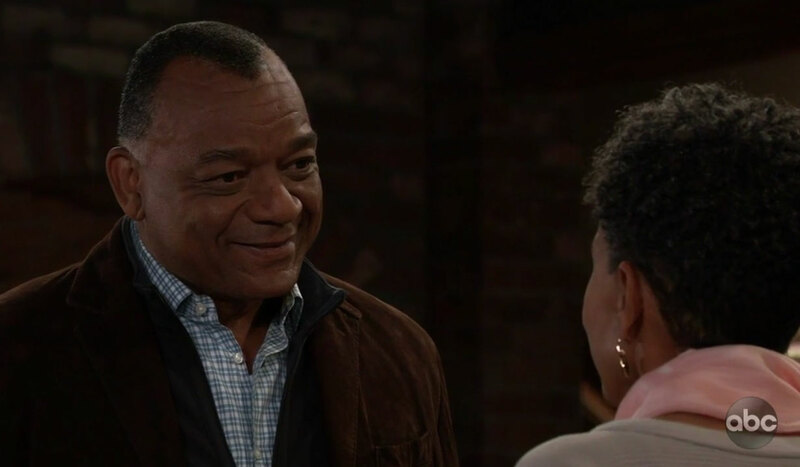 Nigel reveals he just moved to Port Charles because his wife is being treated in town and he wanted to be close to her. Marcus often wondered about Stella and asks if she’s married. She admits she never found the right man. Outside, Drew tells Kim they should prepare themselves to honor Oscar’s wishes should he win his case. Kim won’t hear of giving up, and suggests if they lose that they kidnap Oscar, leave the country and force him into treatment. She’s found a surgeon in Brazil working on cutting-edge treatments, but Drew refuses. At GH, Franco speaks with Kiki about her new half-sister and their falling out. Franco assures her they can overcome this hurdle. Later Kiki runs into Michael and asks how the board meeting went. Michael thinks Griffin did a good job stating his case for reinstatement, and he and others spoke on his behalf. 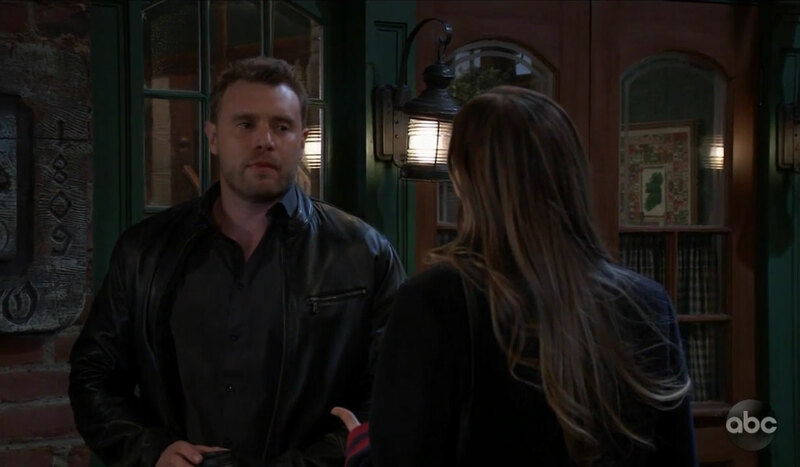 Sam stops by Charlie’s to meet Kristina. Julian offers her a drink while she waits and tries to make small talk about Wiley. Sam is shocked to learn he’s been spending time with Lucas. Julian says he is not pressuring Lucas, and if she wants to let him back into her life then it will be on her terms. Sam gets a text that Kristina’s blown her off for Daisy. She decides to leave and thanks Julian for the drink. Monica and Oscar return to the Quartermaine mansion after spending the day together. Talk turns to his cancer, and she offers to answer any questions he might have. He asks what the tumor will do to him next. She explains his headaches will worsen, and it will drain him of energy and cause him to become weak, and likely he will notice a loss of motor functions and mobility on one side of his body. She promises to stand by Oscar no matter what he decides in regards to his health. Griffin arrives at Sasha’s room at the Metro Court and is clubbed over the head by Ava. She undresses him, puts him in bed with Sasha, and then deletes the text on his phone that she sent him from Sasha. Elsewhere, Jordan and Curtis say their goodbyes and go to their separate rooms for the night. Jordan is surprised in her room with a bachelorette party. Ava heads to GH and cries to Franco that she saw Griffin going into another woman’s room at the Metro Court. She is angry with Kiki, but she doesn’t deserve this, but doesn’t think Kiki will believe her. Franco offers to deal with the situation and convinces Ava to tell him the room number. He finds Kiki and explains a very reliable source has reported seeing Griffin with Sasha at the Metro Court. Kiki learns the room number from Franco and runs out. Afterwards, Franco worries he’s set Kiki up for a world of hurt. Ava, who watched the whole scene, assures Franco that in time Kiki will realize they are the ones looking out for her. Sam finds Drew sitting on the ground outside of Kelly’s. Drew wishes he had a way to stop time and could give Scout more time to get to know Oscar. She knows he’d do anything to save Oscar, but he wonders if he would really do anything. Back inside, Stella is happy to have run into Nigel after all these years. Michael arrives, after getting a text from Mike for a ride home. Mike leaves Stella in Nigel’s capable hands. Nigel promises to see Stella home safely. Kim storms into Charlie’s and asks Julian for favors, illegal ones. She needs papers, fake passports and wants Julian to help her kidnap Oscar in order to get him treated in another country. Julian tries to calm her down and eventually agrees to help her. Nigel tells Stella that he’ll always regret the time he wasted. Curtis realizes he’s trapped somewhere for the night. Peter checks a door, which is locked. Carly wonders what has Ava so brazen. Ava says things are finally going her way. Laura wants “Kevin” to answer questions about what’s going on with him. Kiki walks in on something shocking. Please note that the recap comments are closed due to a glitch during the migration of our new CMS and that we’re working on bringing them back up. Sorry for the delay!